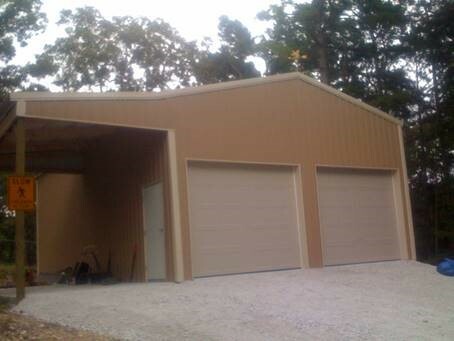 Post Frame Buildings are simple, economical and timeless. 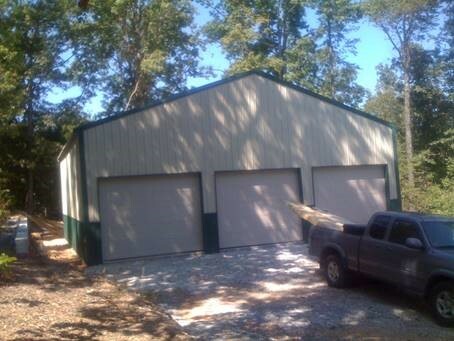 Some people call these Pole Barns. Versions of these buildings have been built for thousands of years. Whatever you want to call it, when we are done, the building will be nice. 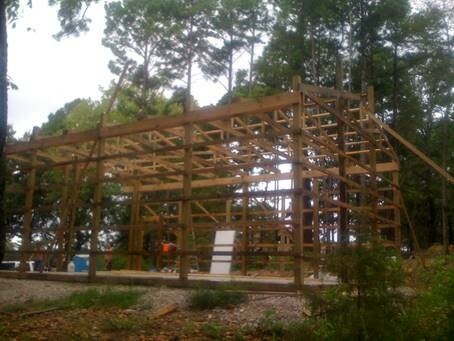 The foundation of a Post Frame Building is the 5"x5" wood post (or 6"x6" on request) going 3 feet into the ground. We pack the post in gravel. By packing the post in gravel we get air circulation and the pressure treated post will last longer. We don't pack the post in dirt because dirt holds moisture, we don't cement the post in the ground because the cement holds moisture. If your building is going to be built next to a water well, we can add post protectors to keep your family safe. A standard concrete floor for a Post Frame Building will include a 4" rock base that has been finely graded; a 6 mil thick poly vapor barrier (this keeps the floor from sweating); concrete wire mesh (this adds both compression and tension strength); and at least 4" thick concrete. We then cut in control joints while the concrete is still green. This formula is good for a 28,000 pound motor home sitting on six tires. Concrete does three things: It gets hard, it shrinks and it cracks. By cutting in the control joints while the concrete is still green, we are telling it where to crack. By doing this, we get straight and clean expansion joints. This gives your building a professional look to it. Even if you plan to never heat or cool your building let us put in a roof condensation control blanket. Double Bubble for the roof is an economical solution. The purpose of a condensation control blanket is to keep it from sweating. Any enclosure will sweat once when there is a temperature difference more than 25 degrees. Insulating these buildings will stop that. If a metal building is not insulated, the sweating (water dripping from the ceiling) is a nuisance in the short term, and a real problem in the long term. Sweating will shorten the lifespan of a building.